Outlets should be securely in the wall of your home. If they are loose or wobble, there may be a problem. If they are damaged, this may also be a problem. You’ll also want to check for GCFI outlets. GCFI outlets are crucial for places where water may reach the outlet. These outlets automatically cut power to the outlet when water is detected instead of turning off the entire breaker. Take a look at the electrical panel. You want the panel to be neat and tidy. If there is additional wire slack, this can be bad. You’ll want to make sure that panel looks good overall. Rust or other signs of wear can mean that you will need a new panel. Certain panels have recently been recalled – if the panel in the home is one of these panels, it will need to be replaced. A trained home inspector should be able to determine if the panel is one of those that needs to be replaced. If the home contains aluminum or knob-and-tube wiring, it will probably need to be replaced. If you are unable to determine the type of wiring, your realtor may be able to determine or know the type of wiring used. If it still remains unknown, a trained electrician can determine the type of wiring and whether or not it must be replaced. Once you get more serious about a particular home, it may be time to bring in a home inspector to identify issues that may not be noticeable on the surface level. 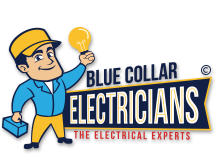 For your electrical inspection needs, Blue Collar Electricians are the people to call. We offer both residential and commercial electrical inspections.